Tobin Ortenblad (Santa Cruz) and Emma White (Cannondale-Cyclocrossworld.com) won the second round of the KMC Cyclocross Festival. THOMPSON, Connecticut (VN) — Tobin Ortenblad (Santa Cruz) and Emma White (Cannondale-Cyclocrossworld.com) won the second round of the KMC Cyclocross Festival, held Sunday afternoon at the Thompson Motor Speedway in Connecticut. 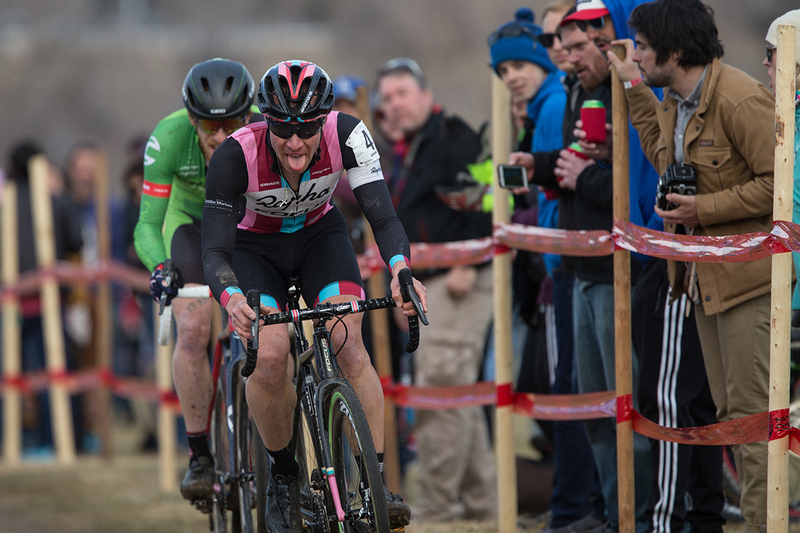 With their victories, both riders also took the lead in the Sho-Air U.S. Cup-CX series, which pays $10,000 to both the men’s and women’s overall winner. Both the men’s and women’s elite races, which carried UCI C2 status, were held on a revamped racecourse from the one they tackled during Friday evening’s opening race of the KMC Cyclocross Festival. Like the original course, Sunday’s course included a mix of pavement and dirt, however, organizers removed a sandy run-up, replacing it with a tricky off-camber slope that included loose dirt and sand. Numerous racers slid out on the tricky section, which became looser with each passing. Still, both races became tactical affairs on the new course, as the presence of long sections of pavement made it challenging for riders to break away. 1. 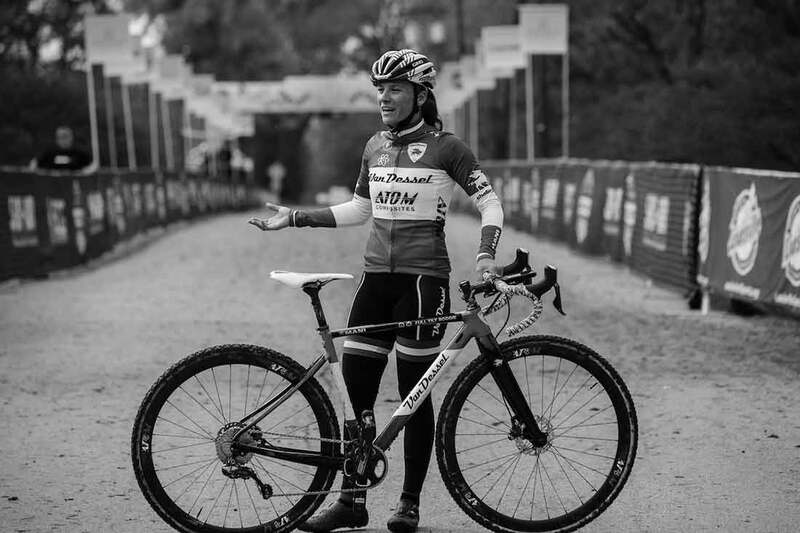 Emma WHITE, CANNONDALE/CYCLOCROSSWORLD.COM, 48:35. 2. Maghalie ROCHETTE, CLIF PRO TEAM, 48:48. 3. Kaitlin KEOUGH, CANNONDALE/CYCLOCROSSWORLD.COM, 49:06. 4. 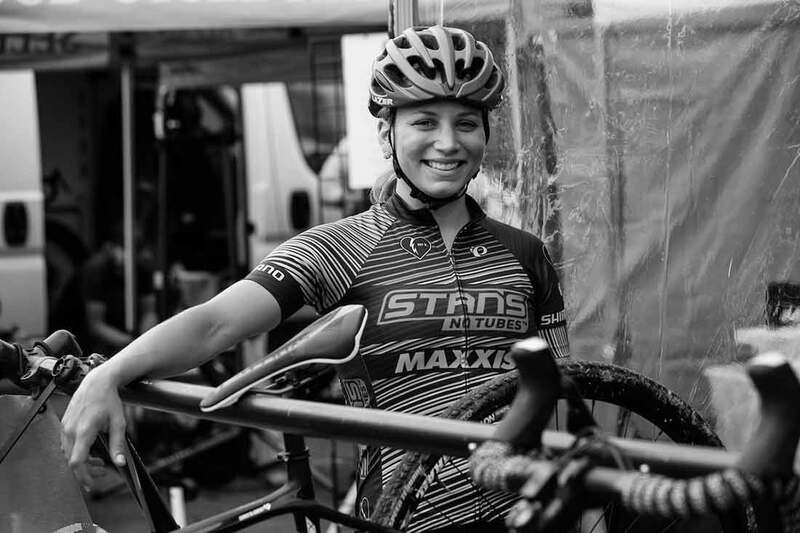 Rebecca FAHRINGER, STANS NOTUBES P/B MAXXIS / GOF, 49:16. 5. Crystal ANTHONY, MAXXIS SHIMANO PRO CYCLOCROSS, 49:16. 6. Christel FERRIER, SAS MACOGEP AQUISIO, 49:22. 7. Ellen NOBLE, ASPIRE RACING, 49:52. 9. Arley KEMMERER, FEARLESS FEMME RACING, 50:13. 10. Allison ARENSMAN, J.A. KING P/B BRC, 51:04. 1. Tobin ORTENBLAD, SANTA CRUZ / DONKEY LABEL RACIN, 58:39. 2. Stephen HYDE, CANNONDALE P/B CYCLOCROSSWORLD., 58:42. 3. Curtis WHITE, CANNONDALE P/B CYCLOCROSSWORLD, 58:44. 4. Kerry WERNER JR., KONA FACTORY CX TEAM, 58:44. 6. Cooper WILLSEY, CANNONDALE P/B CYCLOCROSSWORLD., 59:03. 7. Jeremy POWERS, ASPIRE RACING, 59:06. 8. Denzel STEPHENSON, EVOL, 59:07. 9. Grant ELLWOOD, BCS ELITE CROSS, 59:08. 10. James DRISCOLL, DONNELLY SPORTS, 59:15. White attacked early in the women’ race, stringing out the field on the first section of grass. Her aggression drew out Canadian national champion Maghalie Rochette, and after the first lap the two owned a small gap on the rest of the field. Behind, White’s teammate Kaitlin Keough, who won Friday’s race, was derailed by a flat tire, and was forced to chase after changing bikes in the pit. Rochette was next to go, attacking on a steep run-up, and quickly built a 10-second lead over White. The Canadian looked bound for victory, but on the penultimate lap, White clawed her way back to Rochette’s wheel. White put in a move on the steep run-up and gapped the Canadian. The move was decisive, and White soloed in for the victory with enough time to raise her arms in victory. Behind, Rochette collected second while Keough rebounded form her mechanical to claim the final step on the podium. White called her performance the “breakthrough ride” of her season. Ortenblad, who won Friday’s opening round of the KMC Cyclocross Festival, rode into a front group of elite men that separated itself on the race’s second lap. Created by repeated attacks by Kerry Werner (Kona) and Bjorn Selander (Borah), the group also contained Ortenblad, Jeremy Powers and Spencer Petrov (Team Aspire Racing), and the Cannondale-Cyclocrossworld.com duo of Stephen Hyde and Curtis White. The group played road tactics for several laps, with Petrov and White attacking off the front at the race’s midpoint. But nobody was able to gain a sizable gap on the elite field, and coming into the final lap the group appeared destined to come to the line together. On Friday, a group of seven came into the final section, with Ortenblad winning the sprint. In the final half lap, Hyde attacked the group on the course’s steep run-up, and the move drew out Ortenblad. The two built a small gap on the field, and in the finale, Ortenblad was able to outsprint the reigning U.S. national champion to take his second win of the series. With his win, the Santa Cruz, California native extended his lead in the series overall. The Sho-Air U.S. Cup-CX heads to the Charm City Cyclocross festival this coming weekend in Baltimore, Maryland. 11. Ruby WEST, CANNONDALE CYCLOCROSSWORLD.COM, 51:13. 12. Jennifer MALIK, AMERICAN CLASSIC PRO CX, 51:23. 13. Luarel RATHBUN, DONNELLY SPORTS, 52:08. 14. Regina LEGGE, TREK CYCLOCROSS COLLECTIVE, 52:14. 15. Christa GHENT, AMY D FOUNDATION, 52:23. 16. Katie CLOUSE, ALPHA BICYCLE CO. – GROOVE SUBA, 52:55. 17. Rachel RUBINO, FEARLESS FEMME RACING, 53:06. 18. Taylor KUYK-WHITE, PHILADELPHIA BIKE EXPO, 53:14. 19. Erin FACCONE, TEAM AVERICA, 53:21. 20. Brittlee BOWMAN, HOUSE IND/NOKIA HEALTH/SIMPLEHU, 53:32. 21. Natalie TAPIAS, JAM / NCC, 53:42. 22. Julie WRIGHT, TEAM AVERICA, 53:43. 23. Rebecca GROSS, ZERO D RACING, 54:47. 24. Erica LEONARD, TRANSITIONS LIFECARE P/B GARNEA, 55:04. 25. Dana GILLIGAN, GARNEAU-EASTON P/B TRANSITIONS, 55:14. 26. Leslie LUPIEN, TEAM AVERICA, 55:21. 27. Sophie RUSSENBERGER, DAH?NGER, 55:23. 28. Fiona MORRIS, SPEEDVAGEN MAAP, 46:39. 29. Philicia MARION, AMERICAN CLASSIC PRO CYCLOCROSS, 46:53. 30. Meghan OWENS, UVM CYCLING, 38:21. 31. Turner RAMSAY, ALPHA BICYCLE CO. – GROOVE SUBA, 38:25. 32. Alex CARLSON, CYCLE-SMART, 39:22. 11. Spencer PETROV, ASPIRE RACING, 59:45. 12. Fernando RIVEROS PAEZ, STANS NOTUBES P/B MAXXIS / CZ, 1:00:14. 13. Garry MILLBURN, SPEEDVAGEN MAAP, 1:00:20. 14. Jeremy DURRIN, NEON VELO CYCLING TEAM, 1:00:21. 15. Troy WELLS, TEAM CLIF BAR, 1:00:34. 16. Jack KISSEBERTH, JAM / NCC, 1:00:35. 17. Nick LANDO, ELITE ENDURANCE.COM PRO FACTORY, 1:00:47. 18. Garrett GERCHAR, CLIF BAR DEVELOPMENT MOUNTAIN B, 1:00:56. 19. Brody SANDERSON, CENTURION NEXT, 1:01:05. 20. Justin LINDINE, APEX / NBX / HYPERTHREADS, 1:01:08. 21. Nicholas DINIZ, NCCH ELITE P/B MGCC, 1:01:12. 22. Andy SCOTT, RIVERSIDE RACING, 1:01:16. 23. Ross ELLWOOD, BOULDER CYCLE SPORT, 1:01:28. 24. Dan CHABANOV, HOUSE IND/NOKIA HEALTH/SIMPLEHU, 1:01:57. 25. Jack TANNER, TEAM CLIF BAR DEVELOPEMENT CYCL, 1:02:13. 26. Brendan MCCORMACK, APEX/NBX/HYPERTHREADS, 1:02:18. 27. Marc-Andr? DAIGLE, GARNEAU- EASTON P/B TRANSITION, 1:02:24. 28. Adam MYERSON, CYCLE-SMART, 1:02:33. 29. Anders NYSTROM, CLIFBAR, 1:02:44. 30. Matt TIMMERMAN, CANNONDALE/ CYCLOCROSSWORLD, 1:02:45. 31. Gunnar HOLMGREN, GARNEAU- EASTON P/B TRANSITION, 1:03:11. 32. Zachary CURTIS, BMB RACING, 1:03:41. 33. Andrew BORDEN, X-MEN, 1:03:41. 34. Peter GOGUEN, RACE CF, 1:04:19. 35. Jules GOGUELY, APEX / NBX / HYPERTHREADS, 1:04:36. 36. Patrick COLLINS, MINUTEMAN ROAD CLUB, 1:05:41. 37. Christopher RABADI, UNATTACHED, 58:31. 38. Johannes STROMSKI, KILLINGTON MOUNTAIN SCHOOL, 50:23. 39. David HILDEBRAND, AETNA-EXPO WHEELMEN, 50:41. 41. Nate MORSE, MINUTEMAN ROAD CLUB, 42:44.